Need staircase ideas for a modern living space?The profile cut stringer of the Inca gives this stairs a distinctive contemporary feel. Ensuring the perfect fit with colour schemes the mild steel stringers are filled, sanded and primed ready for finish colour by the client. The stairs is available with our without the decorative stainless fixings. 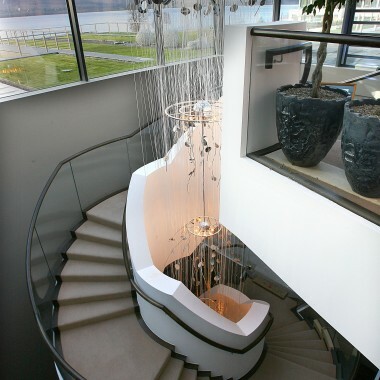 The open rise steps and frameless glass balustrade in this straight stairs example maximises the feeling of space. The stairs is just off the open living space and has the effect of widening rather than narrowing the corridor to the rooms to the rear of the property. As with all stairs in the Signature Stairs range, steps are available in a myriad of timber types with the cherry shown above providing a beautiful warm red finish. Again this straight staircase project highlights the way the Inca can be unobtrusive yet make a strong design statement in a home. 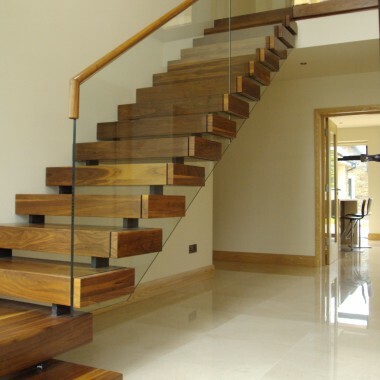 In this example the Inca stairs has been finished with a matching cherry rebated round handrail. The Inca steps are fully clad with 20 mm solid timber of choice on the thread (top, front and back) with a matching veneer to the underside. As these steps are solid timbers, should they be scratched over a period of time they can be simply sanded and re lacquered. Step designs ensure they conform to the regulation 100 mm opening in a rise. The Inca is also available in a close rise version where the steps are fully clad. 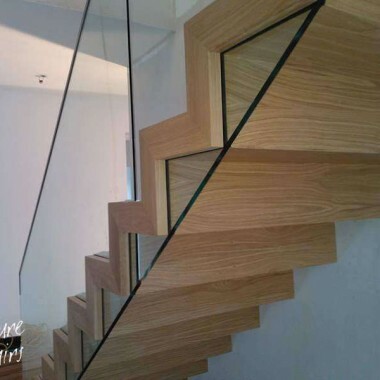 The other main elements of the staircase remain the same with 15 mm clear toughened glass balustrade and profile shape stringers. In this variation of the Inca stairs the stringers are parallel cut rather than the profile shape used in the majority of projects. The more linear shape aids cleaner lines in a stairs that has a turn in its layout. The client in this project chose to finish the glass balustrade with a round 'profile' stainless handrail. In this example the contemporary look of the profile cut stringer is further enhanced with a brushed stainless steel handrail. This ultra slim handrail is both stylish and functional, keeping handrail prints off your glass and giving a visual stop for gallery railing while not overpowering the openness of the stairs. As with all stairs in the Signature Stairs range it is the attention to detail and use of only the best materials that sets us apart from other stairs providers. Your investment in a feature stairs is matched with our expertise and dedication to the satisfaction of our clients. The design of our Inca Stairs was inspired by the linear Inca style. The zig-zag pattern of the stringer is based on the traditional methods used by the Incas. The profile cut stringers are cleverly designed to seamlessly integrate the free standing glass balustrade giving this stairs its own unique character. In either an open step or fully clad option each has its own distinctive personality. Whether you wish to maximise the use of a small space or are looking for more dramatic stair ideas for an open space, the Inca range is perfect. Its clean lines and airiness are a beautiful addition to any modern style home and particularly suited to maximise use of a confined space or incorporated within an open plan room. The timber type and colour of the solid mild steel structure can be customised by clients to integrate the stairs within the overall interior design plan for the home. This fully timber clad Inca shares the profile cut stringer shape but has a more imposing design and suited to a wider, more open space. Combining the profile shape timber stringer with a glass balustrade is a striking feature and will be a real talking point within your home. 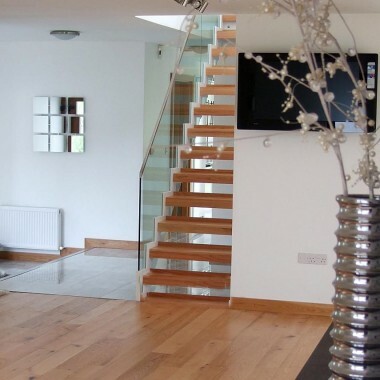 Free standing glass balustrade on either stairs can be finished with a rebated timber or a stainless ‘sleeve’ handrail (see gallery for examples).